Copenhagen, New York, Paris, Toronto, Washington – just some of the cities, which enjoy buildings designed by the international architectural firm BIG founded by Bjarke Ingels. 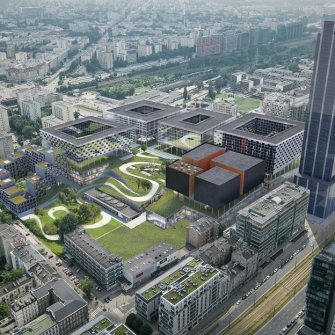 The list will soon be extended by a 230,000 sqm urban plan in Warsaw: Towarowa 22 unveiled earlier today at the 2019 MIPIM international real estate exhibition in Cannes. BIG is an architectural studio founded by Bjarke Ingels, designing and building spectacular, cutting-edge projects all over the world: from North America, to Western Europe and Asia. The best-known projects include Lego House in Billund, Denmark, VIA 57 West and 2 World Trade Center in New York City, Europa City in Paris, Google HQ in California and London, 8 House and the Superkilen park in Copenhagen. The first project in Central and Eastern Europe is a city quarter between Towarowa and Miedziana Streets in Warsaw. „„When designing Towarowa 22 at the heart of Wola district, we drew from the rich cultural history of Warsaw to create a contemporary neighbourhood with lasting value for the future. 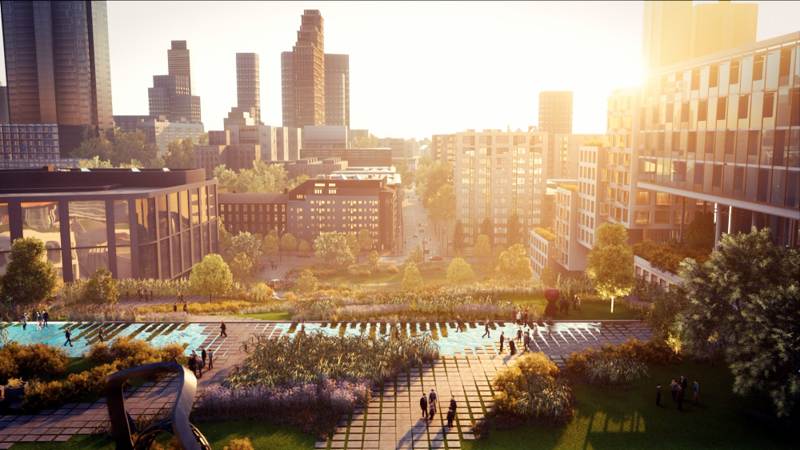 The sandwich of publicly oriented programs and open parks embraced by workplaces and residences form a future city that takes the best of aspects of a lively and activated urban density and a spacious landscape” says Bjarke Ingels, the founder and creative partner of BIG. The central part of the new Towarowa 22 project will be Kazimierza Wielkiego Square. Its decoration will be a renovated pavilion of Dom Słowa Polskiego featured by characteristic skylights and spiral staircases, which are an example of splendid, modernist architecture of the 1950s. The square will be surrounded by buildings of various heights and functions. BIG’s concept also seeks to create a network of pedestrian lanes, thanks to which the project will be connected with the city: Wronia Street, after its reconstruction, will be the most impressive. Covered with a glass roof, it will become a space open to passersby, filled with pubs and restaurants. Towarowa 22 will also be a place where you will be surrounded by culture. One of the Warsaw theatres will be placed here, as well as the only festival cinema in Poland designed for premiere screenings or other major cultural events. „Our ambition is to build a multifunctional, well-designed urban neighbourhood that will attract people and encourage them to live, work and spend their free time there. Architects from the renowned international firm BIG have a similar approach, their projects become landmarks of their cities, regardless of geographical latitude. I am sure that Towarowa 22 will be recognised as a model-designed and built part of the metropolis” adds Mikael Andersson, project director of the Towarowa 22. Towarowa 22 is a plot of about 6.5 hectares located in the Wola district in Warsaw. 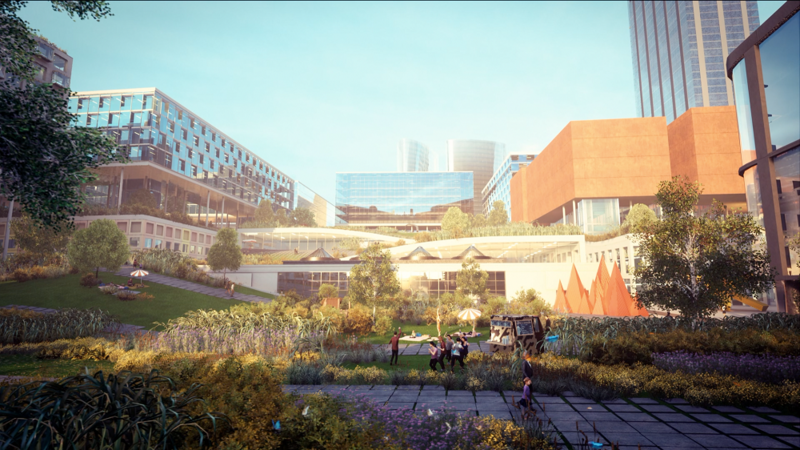 The urban planning concept of its development by BIG assumes that the multifunctional complex will be built here, the buildings of which will have a total of approximately 230,000 sqm of usable area. The owners of the Towarowa 22 project are EPP and Echo Investment.